People stand outside Al Rawdah mosque, where a bomb exploded, in Bir Al-Abed, Egypt, Nov. 25, 2017. (by Adam Lusher and Eduard Cousin, UK Independent, Nov. 25) Cairo, Egypt — Egypt’s air force has conducted air strikes against suspected terrorists after the country’s President vowed to respond with the “utmost force” against militants who killed 305 worshippers at a mosque in the Sinai village of Bir al-Abed. A military source told The Independent that the air strikes had destroyed vehicles linked to the attackers, who used machine guns and rocket-propelled grenades to mow down worshippers in the packed mosque during noon prayers on Friday. “Egypt’s air force is following the trail of the terrorists and has destroyed two or three of their vehicles,” the military source said. Other Egyptian military sources later reported that the air strikes had killed everyone inside the vehicles, although it has not yet been possible to independently verify this claim. It is understood that the air strikes took place in mountainous areas around Bir al-Abed – the small village where the attack took place, 40km west of North Sinai’s main city al-Arish – hours after the attack. At about the same time, Egypt’s President Abdel Fattah al-Sisi gave a televised address to the nation in which he vowed: “The armed forces and the police will avenge our martyrs and restore security and stability with the utmost force. As the official death toll rose to 305 on Saturday morning, more details emerged of the attack, the deadliest by Islamist extremists in Egypt’s modern history. 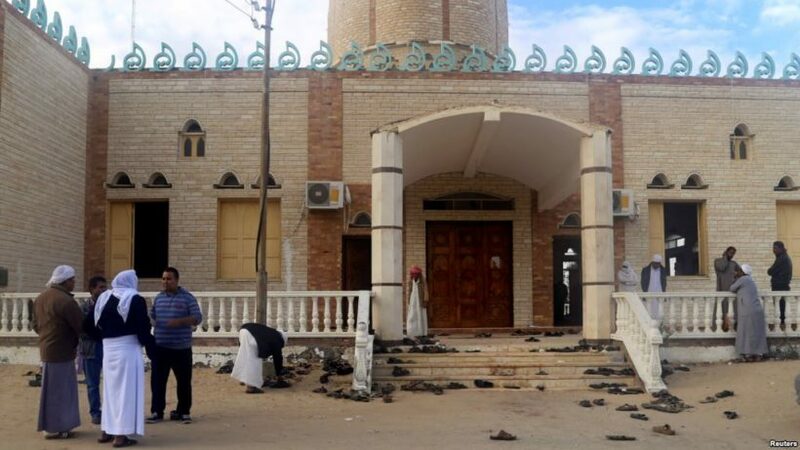 The attack began when five off-road vehicles carrying been 25 and 30 armed men arrived at the al-Rawdah mosque just as the noon sermon was about to start. The main cleric at the mosque, Sheikh Mohamed Abdel Fatah Zowraiq said at least a dozen attackers charged in, opening fire randomly. He said there were also explosions. Officials cited by the state news agency Mena said the attackers fired rocket-propelled grenades as well as machine guns, and shot people as they tried to run from the building. Witnesses speaking to Associated Press (AP) in the Suez Canal city of Ismailia where some of the wounded were taken, told how the attackers spent about 20 minutes killing and maiming worshippers. They spoke of worshippers jumping out of windows, of a stampede in a corridor leading to the bathrooms and of children screaming in horror. Some spoke of their narrow escape from certain death, others of families that lost all or most of their male members. Mansour, a 38-year-old worker in a nearby salt factory, told AP: “Everyone lay down on the floor and kept their heads down. If you raised your head you get shot. Mansour, who said he had settled in Bir al-Abed three years ago in the hope of escaping the violence elsewhere in northern Sinai, suffered two gunshot wounds in the legs. He said that as children screamed in terror, the militants shouted “Allahu Akbar” or Allah is great. …Three police officers on the scene said the militants also used burning cars to block roads, effectively cutting off escape routes and impeding the progress of anyone trying to get into Bir al-Abed to stop the attack. …Egypt’s chief prosecutor Nabil Sadeq said the total death toll currently stood at 305, with 126 people wounded. [Note: In most countries Muslim women stay at home and rarely go to the mosque. The victims in this case appear to have been all men and boys.] It is believed that many of the victims were workers at the salt factory who had come for Friday services at the mosque, which practises Sufism, a mystical form of Islam that extremist radicals regard as heretical. 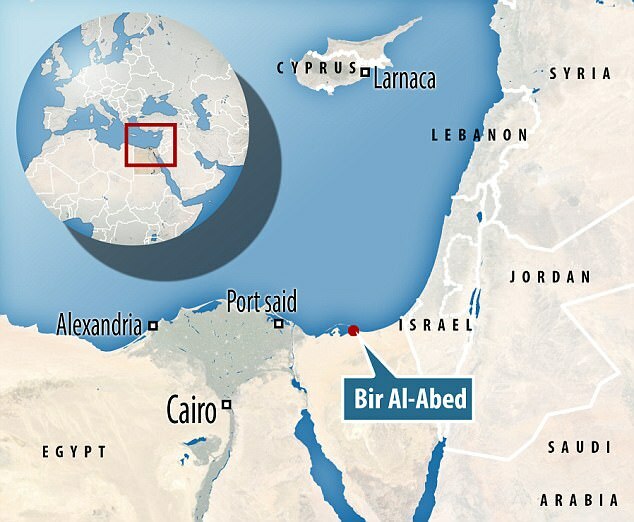 …Responsibility for the attack has not yet been claimed by any group, but since 2011 North Sinai has been the site of an ongoing insurgency by jihadists, who since 2014 have been aligned with Isis. The group is responsible for near-weekly attacks on the army and police in Sinai, and claimed responsibility in 2015 for downing a plane leaving the Sharm El-Sheikh beach resort, killing all the mostly Russian tourists on board. b) When did Egypt’s air force launch air strikes against the terrorists? c) Who were most of the victims of the terrorist attack? d) Why did the Islamic terrorists attack a mosque? There are approximately 1 – 1.8 billion Muslims worldwide (the population of the world is approximately 6 billion)…. Relatively high birth rates in Muslim countries continue to make Islam a fast-growing religion. Smaller groups within Islam include Sufis. There are adherents within all branches of Islam who consider some of or all of the other branches heterodox [dissenting; holding or expressing unaccepted beliefs or opinions] or not actually part of their religion. “Almost every sign points toward Isis in Sinai” being behind Friday’s mosque attack, Mohannad Sabry, a Sinai expert and author told The Independent. The Isis branch in Sinai, which calls itself “Sinai State,” claimed responsibility for the beheading of two Sufi sheikhs in December 2016, accusing them of apostasy and sorcery, and threatened that it would not allow the presence of Sufi orders in Sinai or Egypt. The group has also frequently destroyed Sufi shrines in North Sinai. The military source who informed The Independent of the air strikes also believed Isis was behind the attack. “They attack everyone; Christians, Muslims, the military,” he said. He also suggested the attack could indicate a change of tactics, as this is the first such large-scale assault directly targeting civilians in the region. “They did kill civilians, but not at this scale,” he said. “The terrorists are hiding in between the civilians, that’s the problem,” he said. President Sisi announced three-days of mourning in response to the attack.